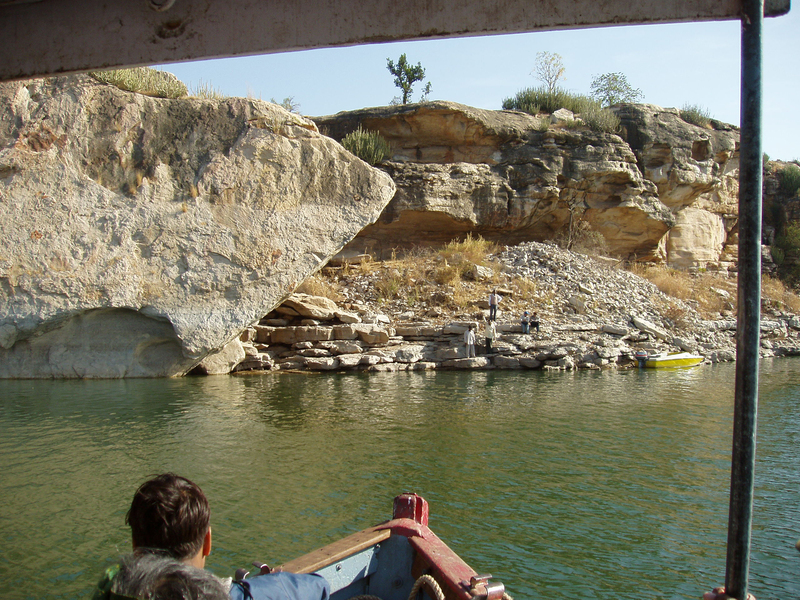 Our second India trip in December 2004 took us to the Chambal valley region, in the Bhanpura-Gandhi Sagar area, north of Bhopal, still in Madhya Pradesh but close to Rajasthan. The highlight undoubtedly was the two separate visits we made to the Chaturbhujnath Nala sites, but we also visited two other very different sites that were quite interesting. One of them can only be accessed by boat, after passing a military checkpoint and with special permission. After a half an hour ride up the river, starting from the huge dam on the Gandhi Sagar lake, we reached a big shelter a few meters above water level (Photo 34), called 4. Magazine Shelter. 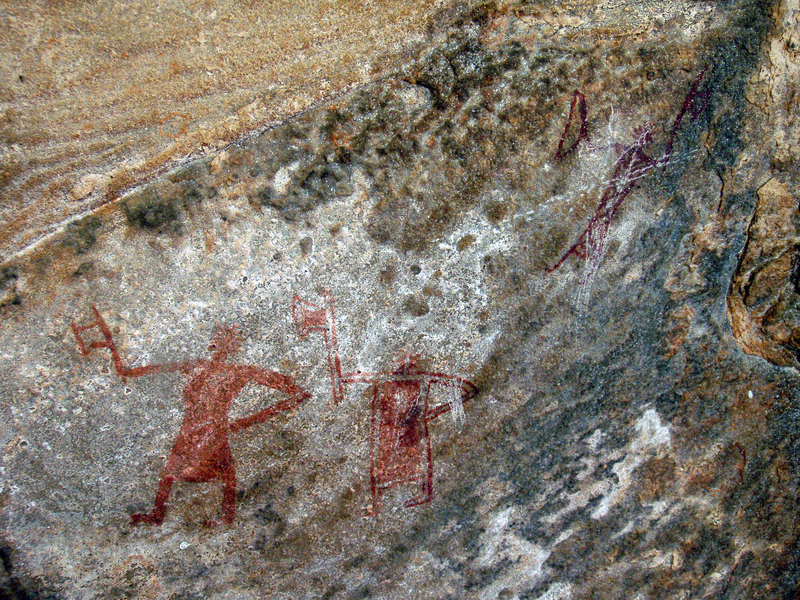 The painted figures were not very numerous and some old graffiti marred the walls. One painting in faded red was conspicuous and it was the only one of its kind that we saw. It represented a big (1.45m high) vertical crocodile, perfectly rendered in dynamic style with the internal organs described, i.e. in what in Australia is called the X-ray style. Next to it were nine small humans in small groups, including some armed with axes. On our return to the dam we had the good surprise to catch sight of a huge and very alive crocodile basking in the sun. We also saw the now famous Daraki-Chattan site. 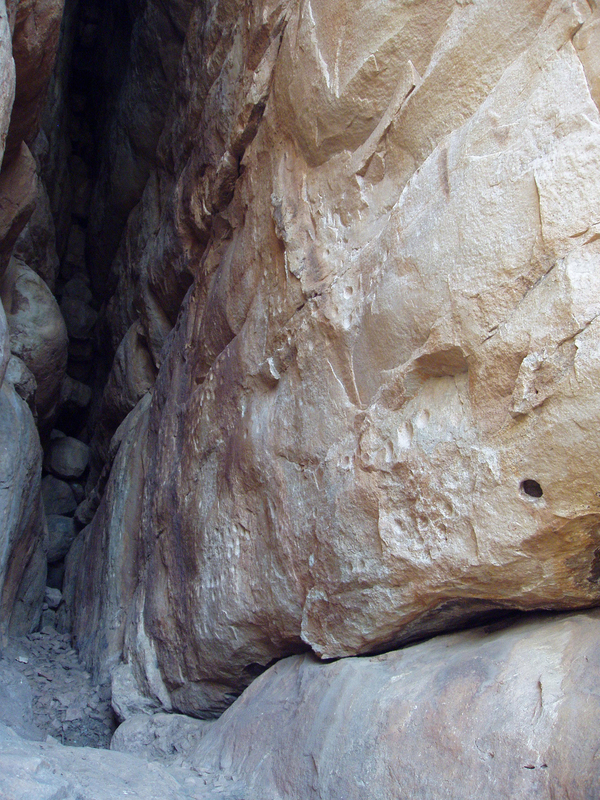 A small narrow cleft in the tall cliff faces the valley of the Rewa. 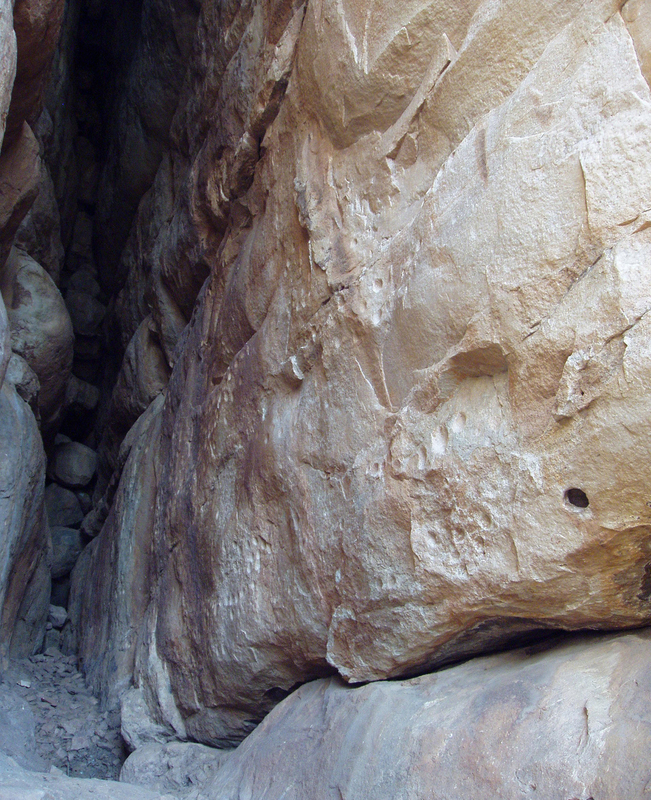 Its sides are covered with hundreds of deeply patinated cupules (Photo 38), 498 according to Dr. Giriraj Kumar, who led us there and who has been excavating the slope right outside the cave (Kumar 2000/2001). In his excavations he found another cupule on a fallen rock under a 50 centimeters thick upper layer and others in slabs recovered from the archaeological layers. The lower layers are all Acheulian. The discovery in theses layers of hammer stones supposed to have been used for the production of cupules was announced at the 2004 Agra Congress (also see Kumar 2002). 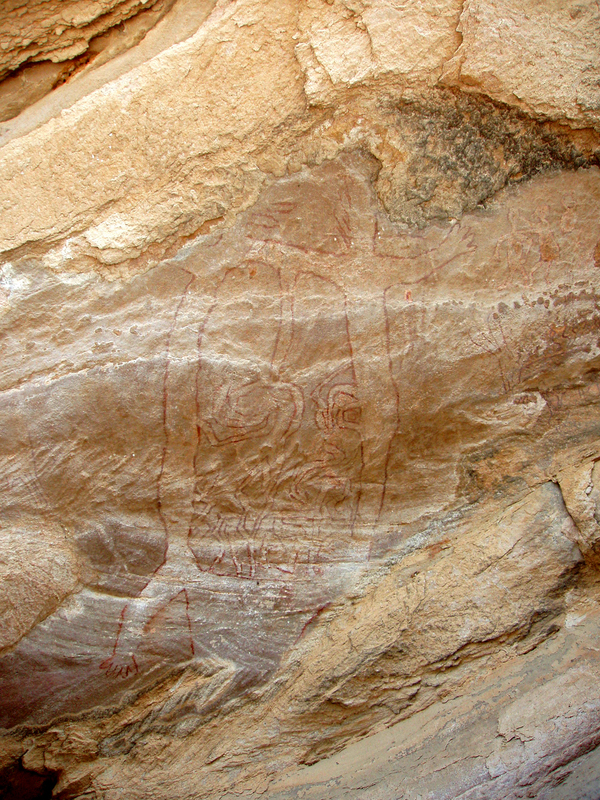 If these cupules are indeed Acheulian made they would be the most ancient rock art ever found in the world (Bednarik 2000/2001). 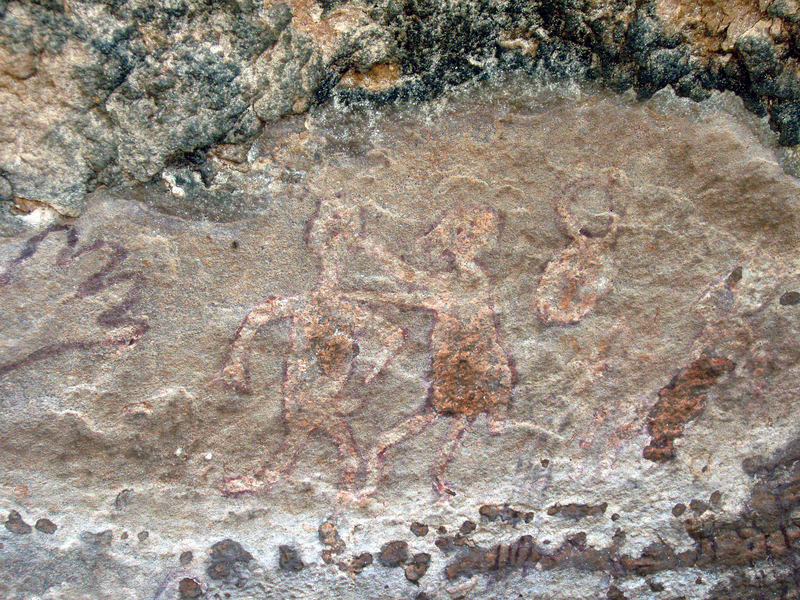 An international project called "Early Indian Petroglyphs", associating researchers from RASI (Rock Art Society of India) and AURA (Australian Rock Art Association), under the aegis of IFRAO (International Federation of Rock Art Organizations) and the leadership of both Robert Bednarik and Giriraj Kumar, has been working, with many different techniques, on the fascinating problem of dating these cupules since 2001and the work is going on.